Adrian Nastase was born on June 22, 1950 in Bucharest Romania. He is a famous Romanian politician. Nastase graduated the Law Faculty and the History-Philosophy Faculty in Bucharest. He taught international public law in different schools in Bucharest (1990-1992).Between 1976 and 1989 he was a member of PCR (the Romanian Communist Party). He was also a FSN member. From June 1990 till October 1992 he was Romania's external affairs minister. He becomes president of the Chamber of Deputys and the president of the Parliamentary Group of Friendship with the United Kingdom of Great Britain and Northern Ireland (1992- 1996). In 1996 he is named president of PDSR (the Romanian Social Democrat Party) and member of the Romanian Parliamentary Mission at the Europe's Council Parliamentary Meeting. He becomes vice-president of the Chamber of Deputies and a member of the Permanent Bureau (he assures the connection between the following commissions: the Discipline and Immunity Juridical Commission, the External Affaires Commission, the Culture, Arts and Mass-media Commission). 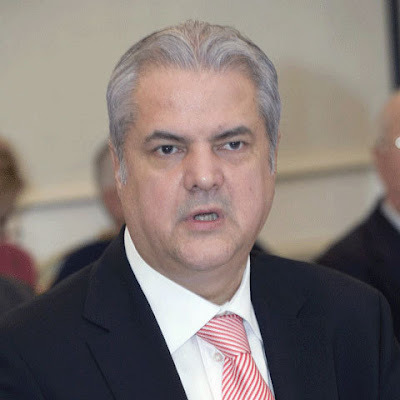 He is also a member of the sub- commission for the human rights.In 1997 he becomes prim-vice-president of PDSR and in December 2000- temporary president of PDSR and Romania's prime-minister (he leads the Government with the biggest economical increase since after 1989, but also with many corruption accusations). In June 2001 he is named president of PSD.In November- December 2004 he runs for Romania's presidency as a candidate of PSD but he is defeated by Traian Basescu on the second tour.In April 2005 he looses the presidency of PSD, remaining the executive president of the party.He got married on 31 July 1985 with Dana Nastase, the daughter of the ex communist leader – Angelo Miculescu. They have two sons- Andrei and Mihnea. In 2005 and in 2006 he faces corruption accusations and is forced to resign from the Chamber of Deputies presidency function and from the party's executive- presidency function. Adrian Nastase was the prime-minister of Romania between 2000 and 2004 and from 2005 till 2006 was the president of the Chamber of Deputys and executive president of PSD (Social Democrat Party). - "The political idea of change"
- "International economic law II"
- His hobbies : tennis, fishing and hunting. - He speaks fluently English and French.